If You Are Charged With a Crime in Williamstown You Need Lawyers That Know Criminal Law Front and Back. Our Lexington Based Firm Handles Criminal Cases in Grant County and Throughout The Bluegrass. There are few events in life more stressful than being charged with a crime. We have dedicated our careers to defending the accused, and as a result, we know the ins and outs of the criminal code. If you or a loved one have been convicted of a crime contact our Lexington criminal defense attorneys at Baldani Law Group PLLC to figure out what to do next. We can listen to the facts and help you decide what is best for you. For most cases in Grant County, there is no travel fee. Call us now at (859) 259-0727 or contact us online to schedule an appointment for a consultation. The Grant County Courthouse is staffed by Grant County Circuit Clerk Tina Melton. Monday: 8:30 a.m. – 4 p.m.
Tuesday: 8:30 a.m. – 4 p.m.
Wednesday: 8:30 a.m. – 4 p.m.
Thursday: 8:30 a.m. – 4 p.m. Parking lots are located beside and behind the Grant County Judicial Center. In general, the district court presides over traffic cases and misdemeanors and the circuit court hears felony cases. Felony cases tend to originate in the district court at a preliminary hearing (though they can be directly indicted), and are transferred to Circuit Court if probable cause if found at the preliminary hearing and the grand jury chooses to indict. Our Williamstown Criminal Defense Lawyers defend cases in both Grant County District Court and Circuit Court. The Honorable Judge Lester has been on the bench since 2007. Prior to becoming a judge, she worked as an assistant county attorney and in private practice. The Honorable Judge Funk won re-election in 2015. He was unopposed. The County Attorney, the Honorable Lescal Joe Taylor handles prosecution in Grant District Court. His office handles the prosecution of traffic, misdemeanor, and felony preliminary hearings. His office is located inside the courthouse. Judge Knight has been on the Circuit bench since 2015. Prior to her election in 2014, she worked as an attorney in private practice, specializing in family, criminal, probate, civil litigation, and real estate law. Prosecution of felonies is handled by the office of the Hon. Jim Crawford. His office is located in Carrollton. His office prosecutes offenses that have been indicted by the Grant County Grand Jury. If you have been charge with a crime in Williamstown or anywhere in Central Kentucky, give our firm a call today. We’ve handled cases in Grant County and throughout the Bluegrass and know what it takes to stand up for you. Don’t Give Up. Don’t Delay. Get a free consultation now and find out why our firm is the right firm for you. Call Baldani Law Group today at (859) 259-0727 or contact us online. 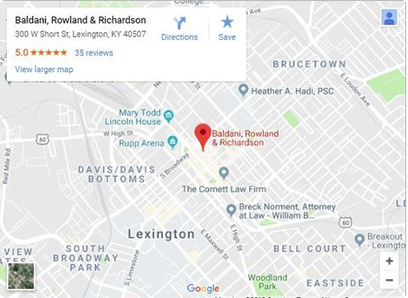 Established in 1988, the Baldani Law Group has successfully represented thousands of individuals across the Commonwealth of Kentucky. With over 100 years of combined experience, let our team of attorneys fight for your rights.